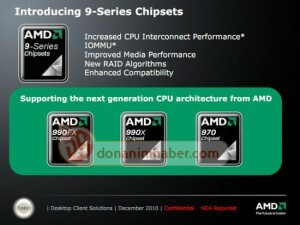 AMD fans have been eagerly awaiting for the Bulldozer-based CPU(s) to become available. Last week there were rumoured to be some minor changes in their release schedule, although AMD denied this. Today, however, we have some more juicy details on the series 9 chipset from our friends over at Nordic Hardware and Donanim Haber. We’re told there will be three chipsets in the 9 series, all of which use the Bulldozer architecture: 970, 990X and 990FX. Not only will these leverage AMD’s new 32nm technology for the CPU(s), they will also require a socket AM3+ on the system board. As per usual, the FX suffix denotes the chipset with the best feature set. So, what goodies do you get with this chipset? Everything except the kitchen sink! SATA 6 Gb/s (with SSD TRIM support), USB 3.0, RAID 0/1/5/10 (RAID 5 only with SB950) and IOMMU (better virtualization and memory I/O performance). 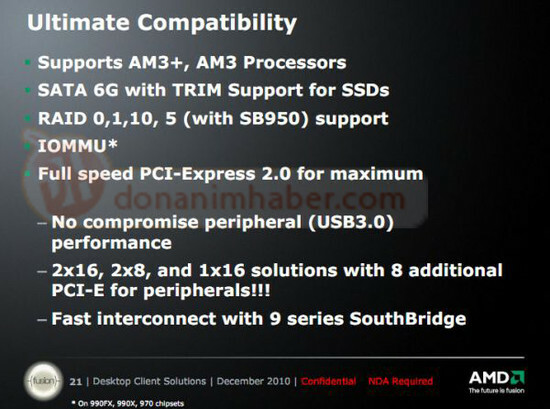 There are a few items to note: “no compromise peripheral” for USB 3.0 is touted, possibly due to the use of PCIe 2.0 within the chipset. As more devices take advantage of USB 3.0, this feature will be very welcome. Lastly, the 990FX chipset is the only one touting two full x16 PCIe lanes, which is good to know if you plan on using Crossfire. There will be more to come as we get closer to the reported launch date of Q2 2011. I will be Standing in line/on newegg at 12:00:01 when Bulldozer finally breaks. Interesting but honestly nothing "new" that we already weren't speculating. 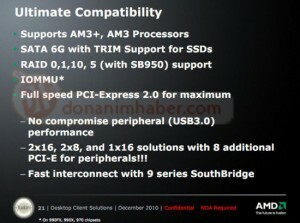 I'm glad AMD are integrating USB3 into the 9-series, and kind of disappointed to see it omitted from the P67/H67 chipsets for Sandy Bridge. when does the bulldozer being released? unoffical channels have it coming in April. Cant wait for these. Do u guys think it will drive down the prices of the thubans? ahh how much cheaper can they get? Here is to hoping these bulldozers can take out a sandybridge!